In February 2017, Bishop Robert McElroy of the Diocese of San Diego, addressing the U.S. Regional Meeting of Popular Movements, spoke of Pope John XXIII’s encyclical “Mater et Magistra” (1961) and its call to restructure the economies of the world using the methodology of “see, judge, act.” We can apply the same method toward a just treatment of refugees and migrants by the United States. Pope John challenged young people especially to adopt this method, which is not immersed in abstraction but action. The first step is to review the concrete situation that needs change: What are people experiencing and how are they responding? Is there helpful data available? The second step is to ask: How did the injustice develop? One forms a judgment from theological reflection, Scripture, social teaching and social analysis. Finally, there is the third step: What can and should be done to address the root causes of the injustice? What actions can address the social structure that causes it? How can the relationships or structures that created the injustice be alleviated or transformed? Theological reflection or contemplation results in pastoral action. Pope John challenged young people especially to adopt this method, which is not immersed in abstraction but action. This approach has its roots in the work of Joseph Cardijn, a Belgian priest and later cardinal, who founded the Young Christian Workers in 1912. The bishops of Latin and Central America (CELAM) used the “see, judge, act” methodology to address structural injustices at their meetings at Medellín, Colombia (1968), and Puebla, Mexico (1979). These conferences dramatically articulated the teaching of the Synod of Bishops in 1971 and its document “Justice in the World,” which stated that acting on behalf of justice and the transformation of the world is a constitutive dimension of the preaching of the Gospel. By the time of the 2007 meeting of CELAM in Aparecida, Brazil—at which Pope Francis, as Archbishop of Buenos Aires, played a significant part—the “see, judge, act” process was more familiar. Cardinal Bergoglio, an advocate of this method, was among those calling for the meeting’s document to include a chapter on “how to see,” or how to be instruments of the Spirit by which Jesus Christ is better known, followed and loved. Pope Francis and the U.S. bishops teach us precisely “how to see,” particularly in their critiques of the global immigration crisis. In his address to the U.S. Congress in 2015, Pope Francis stated that the world is facing a refugee crisis of a magnitude not seen since World War II. He acknowledged that the crisis presented difficult choices, but he encouraged Americans not to be overwhelmed by the sheer numbers and instead to listen to the stories of immigrants and refugees―and to respond in a way that is humane, just and fraternal. “We need to avoid a common temptation nowadays to discard whatever proves troublesome,” he said. Now consider the priorities of the Trump administration. They have included the hiring of more Immigration and Customs Enforcement agents; the construction of a border wall between Mexico and the United States; the processing and return of unaccompanied minors and the seekers of asylum as soon as possible; the utilization of a “merit-based” system of immigration; the end of the Deferred Action for Childhood Arrivals program that protects young adults brought here as children; and, most recently, the separation of children from families deemed to have crossed the U.S. border illegally. Also note that 85,000 refugees were admitted to the United States. Despite the continuing refugee crisis, in 2017 that number dropped to 54,000. The administration has set an even lower cap of 45,000 for 2018, and the pace of new admissions suggests that far fewer will be resettled here. Pastoral leaders have had many opportunities while walking with Pope Francis to see the disparities and inequalities in our society that must be addressed and to make judgments about these issues―chief among them our immigration policy―with a theological and scriptural lens. Now it is time to act. What persecution? What root causes? If the bishops are interested in what caused the problems, they should look at what caused prosperity elsewhere. Otherwise it will be futile. They should be seeking refuge in Latin American countries. Unless every Latin American country is dysfunctional. If so, why is that? I would not look to any Catholic program for an answer. 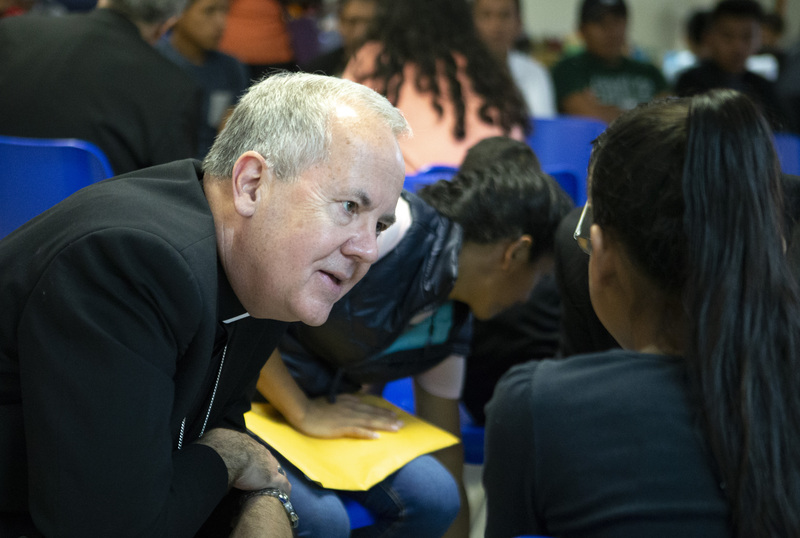 "The U.S. bishops have supported efforts for the just treatment of refugees and migrants". What specifically are the efforts that our bishops support to ensure just treatment of illegal migrants to the U.S. who are motivated only by desire for more material goods? Sheltering the homeless is not an act of justice; it's a work of mercy. By framing this as a justice issue, McKenna basically condemns private property. Disappointing for a canon lawyer. The problem is NOT alleged "disparities and inequalities in our society." Nor is it the fact that we have immigration laws, or that we enforce those laws. The problem is that something is rotten in much of Latin America, and until that problem is solved there will continue to be "refugee crises" of one degree of severity or another. We can't solve that problem, and to suggest that we can or should (presumably be addressing the afore-mentioned "disparities and inequalities" in OUR society) is illogical and disingenuous. If this "see, judge, act" approach were of any value, then why has its repeated application by CELAM over the last FIFTY years (according to the article) been so spectacularly ineffective? Yes, drug usage in the United States funds the cartels and a lot of their violence. But interesting is the lack of cooperation by Mexico in interdicting this drug trade. Why? Some of you have obviously put your political allegiances ahead of your commitment to live as disciples of Christ, if in fact you ever made such a commitment. Father McKenna, from what I can tell from the article, puts Christ first and proceeds from that starting point in deciding which course of action to take or whether to defend or criticize a certain policy, law, etc. The Church would be much stronger and more effective if more of us lay Catholics would focus primarily on being Christians and give little or no regard to the conservative / liberal dynamic that so many of us have bought into, one way or the other. This phenomenon has resulted in a grotesque debasement of what it even means to be a Christian, with self-proclaimed Christians supporting everything from selective late-term abortion on one side to deliberately cruel policies enacted for the purpose of inflicting even greater misery on those who are desperate enough to flee their own countries and take their chances as refugees on the other. Does the Kingdom of God not transcend these categories? Some of you act as if it doesn’t. Do you believe that there will in fact be a Day of Judgement? Will He recognize you (or me) on that day? What will you have to say in regard to “the least of these”? Point to someone else and say “what about him?” These questions are not rhetorical. I am genuinely interested to know. Ashley, you are accusing others without asking questions. The Catholic Church has a tremendous success record of getting individuals to do good. It has an equally bad record of political meddling. Their intentions may be good but the results are too often bad, Prosperity in this world originated in one small place with a couple of relevant ideas that blossomed. I have yet to see any article by the editors/authors acknowledging this or recommending the approach to the rest of the world. Like a mustard seed prosperity grew out of ideas in England and Holland in the 1700's to improve almost all the world. For those who disagree, ask why Philadelphia was probably one of the most vibrant cities in the world including all its residents just 70 years after its founding in the late 1600's. Just after 1750 it became the second largest city in the English empire. The answer is freedom and land ownership. Something most of the world still lacks today. So if you want prosperity, look to what made Philadelphia so succssful just a short time after founding. There was even a Catholic Church and a synagogue. Ashley, You raise some good points as do others here, but please do not judge what you do not know. Sometimes the "devil is in the details." Others here have raised American addicts' demand for drugs originating south of the border, for example. When BREXIT happened, I saw a reporter ask someone from a small town (solidly BREXIT area outside the big cities). The man said he had no problem with the immigrants in his area personally, but the UK government had dumped a bunch of them in his town WITHOUT adding more medical personnel (they have socialized medicine), law enforcement, teachers, etc. He had a lot of trouble now getting in to see a doctor when he needed an appointment. Similar things have happened in small towns in Italy (which I saw on a pro immigration documentary) near their coasts. Hospitals in TX border towns have periodically had to close their ERs for because of "frequent flyers" (border crossers who pop in for medical treatment or to give birth in the US). Secondly, I have noticed that many of these immigrants come from predominately Catholic countries. What is the church doing to help them in their native lands? I write this, BTW, as the proud granddaughter of Polish and Lithuanian immigrants who also came here with very little, although, of course, they did it LEGALLY because they knew they could be deported for any reason (as happened to my maternal grandmother's friend who came over with her). I sympathize with immigrants also because I taught them as students for a dioscean sponsored ESL class. I think our government, along with the churches, needs an outreach program in these countries to prepare people on how to come over legally, and to warn them what can happen if they don't , and to explain what can happen with smugglers and traffickers. Many of these folks are illiterate in their own languages by the way, so they need this help. I plan to write the President, my representatives, and DHS about this. Many RC parishes in the US (as well as other faiths) have Spanish speakers who might be able to help. Finally, please re-consider judging others before you know "the rest of the story." Would you consider it appropriate to call out a person of reputed Christian faith who supports unrestricted access to abortion based on some such principle as “a woman’s right to choose?” Would it be appropriate to point out this glaring inconsistency? Was Saint Paul guilty of being judgmental in sometimes uttering or writing strong rebukes to “Christians” who clearly subscribed to a different ethical standard than that of Jesus, justifying in their own minds all kinds of things that were contrary to the Gospel? Now, with regard to immigration, there are plenty of people of genuine faith who are more conservative than I on that issue. Maybe they favor a more restrictive policy than I would prefer, or perhaps more of a merit based system, as has been proposed. I would not for a moment think of calling into question the genuineness of such people’s faith for that reason. There are also those putative Christians, however, who advocate mass deportation of all undocumented immigrants in this country, regardless of when they came, the circumstances that drove them to do so or the devastating impact that such a policy has on families. Such a mindset is no more compatible with Christianity than that of enthusiastic support for abortion on demand. I was right to point out this type of inconsistency and will continue to do so. That does not constitute the sin of judging others. For the record, I'm Pro Life. I was merely trying to explain a few reasons why some of the mass migrations have been problematic over the past several years. Many folks, especially in urban settings are unaware of why there have been problems managing immigration. Maybe you know about them, maybe you don't. If I have misunderstood you, I apologize for it. I have also written to my Member of Congress (and will also write my senators and the President very soon) with some views on how to fix our broken immigration system, which includes increased border security, extended guest worker programs (worked well for many years in Germany) so people can live and work legally while figuring things out, and an outreach program in Central America in conjunction with faith organizations to prepare would be immigrants. In rural hamlets, churches would be very helpful; CRS is already one of the largest federal contractors in HHS' overseas aid programs anyway. Programs could consist of both paid staff and trained volunteers to help fill out forms (some newer migrants are illiterate in their own language), explain needed documentation, the immigration processes, and brief them on the pitfalls of using smugglers. They could also tell them what happens if they do not comply with the law. I am doing my best to be part of the solution (have even taught ESL to immigrants), but I am NOT perfect. God has a long way to go with me, and I am trying to be a proactive Christian. Have a nice day. I’m not trying to have the last word, but I had assumed that you were pro-life. My point was that being pro-abortion is not the only way that some people claim a Christian identity while giving moral or material support to causes or policies that are antithetical to the message of the Gospels, and that calling these people out on the huge discrepancy between what they publically claim to believe and the policies they support is entirely appropriate. In fact, we are sometimes morally obligated to do just that. This has nothing to do with who has come closer to perfection than who. I find it necessary to go to confession pretty regularly myself for a reason, and it’s not because I have achieved a high level of holiness. The crucial thing is that we at least make an honest effort to live as Jesus taught us to live and to not disavow His teaching whenever it no longer suits our purpose in the political arena. Or (perhaps even worse) to deliberately obfuscate that teaching so as to be able to make it fit, albeit somewhat awkwardly, with our political and ideological preferences. As far as I know, you have not been guilty of this offense. But many others on both the political left and the political right have in fact subjugated their commitment to Christ in order to give primacy of place to the demands of certain ideologies or political expediency. I pointed out that this is unacceptable, and you objected to my doing so on the grounds that I was judging others without being aware of their situation. But my criticism had nothing to do with the sin of judging, as explained above. I’ll bet that you would agree with me that our first commitment has to be to Christ, if we are to be Christians at all - at least in any meaningful sense of the word. Sometimes that means having the courage to publicly stand up for truth, come what may. There are not conservative Christians, and there not liberal Christians. There are only Christians. For a person of God, committed to the way of Christ, the very words conservative and liberal should basically have no meaning. Truth can stand on its own merits and does not need the support of such constructs. The failure of many within the Church to understand this basic principle underlies the absurdity of So-called Christians advocating the things that I have mentioned above, along with numerous others equally repellent . It is an intolerable situation and has to change. If doing my little part to bring about this change makes me guilty of judging in the eyes of some, then so be it. I would have no problem whatsoever in looking Jesus right in the eye and repeating word for word what I have just stated here. This is true with everything that I profess to believe, religiously or politically. As for how well I have become the Christian person that I am called to be - well, I’m afraid that’s a different story. Lord Jesus Christ, Son of God, have mercy on me, a sinner. You assume you are right. The best way to expose the morally inferior position of those you object to is ask questions. Maybe their opinions are nothing more than unsubstantiated feelings. Ashley, I'll keep my remarks brief. I'm a former long-time Democrat of more than thirty years (I'm 56) who became a registered Independent about 5 years ago because neither party fully represented my views. Several years ago I very reluctantly became a registered Republican, although I largely disagree with typical Republican policies. For instance, I oppose capital punishment, support stringent gun control laws, and support reasonable government laws and regulations to protect our environment. I also support reasonable government assistance for the millions of Americans in need. Finally, although I'm not a pacifist, I respect their convictions. I favor war only as a last resort after all diplomatic efforts have been exhausted. Civilians must never be deliberately targeted, and nuclear weapons must never be used. When I worked in a group home years ago with disabled men, several of my co-workers were immigrants from Liberia. They had fled from a brutal civil war seeking a better life for themselves and their families. At the nursing home where I live, a number of the staff are immigrants from African nations, and in general I respect them for their care and dedication. I believe that immigrants should be welcomed and that a path for citizenship should be found for them. Also, I believe as a Catholic, son, retired teacher, and uncle that children deserve to be raised in a family, I oppose the policy of separating children from their parents. However, I do support the restoration of legal protection for the innocent unborn from the violence of legal abortion (with the rarely needed exception to prevent the death of the pregnant woman). I believe that we as Catholics must join with people of other faiths to not only pass laws to reduce the violence of abortion but also support the hundreds of crisis pregnancy centers nationwide which provide pregnant women and their babies with practical, compassionate assistance. I occasionally make modest contributions to "The Mother's Home" in suburban Philadelphia . This is a home for homeless pregnant women and their children which also provides other services. Probably the most comprehensive center in terms of services that I make modest contributions to occasionally is "Mom's House." This is a network of about six homes which provide low-income pregnant women with free quality day care so that the women can complete their education . I’m not really sure why your post was addressed to me in particular, but for what it’s worth, I agree with these positions, with the possible exception of strict gun control (would depend on what you mean specifically). Also for what it’s worth, I am an independent and have often voted for both Democrats and Republicans, usually with no small amount of misgiving. Generally speaking, I respect the opinions of those who disagree with me. And I have changed my mind on many things over the years and come to believe that my former political adversaries were right after all, not that I am anyone of the slightest importance. Most things political fall into the category of contingent and partial realities, not absolute truth; thus differences of opinion should be respected. I highly recommend Reinhold Niebuhr’s “The Nature and Destiny of Man” for a brilliant criticism of how such partial and contingent truths can be given a false absolute validity which, when coupled with Christian faith, can become a form of idolatry. These, however, are extreme times that we are living in, and now we have the opposite problem: that of nothing being sacred, everything being fair game, and of everyone ‘s individual truth (my truth, my alternative facts, my alternative non-biological gender identity) being given serious consideration or even considered universally valid. The political right and the political left are both responsible for creating this situation of almost mandatory stupidity, as well as for its perpetuation. Being a person whose personal bravery barely rises above that of the practicing coward, I do not have a martyr complex. I do believe, however, that in the coming years and decades, a person, even in this country, will have to be willing to have a lot more enemies than friends just to proclaim publicly that he is a Christian, that eternal truths are not subject to revision or modification, and that the love of Jesus Christ encompasses all human beings and is , or should be, the basis from which all Christian activity proceed. The editors placed this article in a section of the publication labeled “short takes,” and rightly so. It is nothing more than a journalistic dispatch on a longer talk by Bishop McElroy which, in itself, was something of a “short take” on a much longer presentation, via encyclical, by Pope John XXIII. And that publication, itself, was frustratingly short as a treatment of a subject both profound and complex. I share the frustration of readers who yearn for a comprehensive treatment of this subject specifically as it pertains to our southern border situation, that coherently integrates the aspects of the problem (geopolitical, cultural, economic, moral) with a suggested path toward a solution. In this case, a solution would be a postulated one, namely, what is the desired end state, or policy objective, to be pursued? To name and describe the solution would be to recognize that the steps or strategies to be followed would have many components: it presents as a geopolitical problem but with many moral and ethical components, and all kinds of economic, social, national security and, yes, racial implications. And in proposing strategies we would have to keep in mind that strategies, as practical, concrete actions, sometimes fail, or possibly worse, achieve unintended, sometimes alarming, consequences. This is where Plan B, alternative strategies, come in. And we pray also that there exist virtuous public servants who habitually practice those invaluable moral virtues, Prudence and Justice. “See, judge, act” isn’t going to get you that job at McKinsey, or Doctorate in Physics. Without hypothesis testing and feedback the “act” proscribed may have the exact opposite effect from that which was intended. And largely this is why we have illegal immigrants. The Church does nothing to very little in assuring property rights in Central and South America, guaranteeing a feudal and sustinence level of existence for the indigenuous peoples. That, Rev. McKenna is a sin. Thank you Fr.McKenna. I find that we must honor Christ not through walls or division but through compassion; to see through the eyes of those who are hurt or being hurt. This is our universal call to action and holiness as Christians. This essential element of our faith needs to be identified and magnified in our churches, that others will see and know we are a faith-filled people. Jesus never said love to your neighbor if only your borders are secure and they cannot take what you have. Somehow, this has entered into our country as the basis for rejecting others and not taking care of the refugee and migrant. Tearing apart families is not a Christian virtue. The Rev. Kevin E. McKenna, J.C.D., Ph.D., is the rector of Sacred Heart Cathedral, in Rochester, N.Y., and a former president of the Canon Law Society of America.